← So true, Sow True! 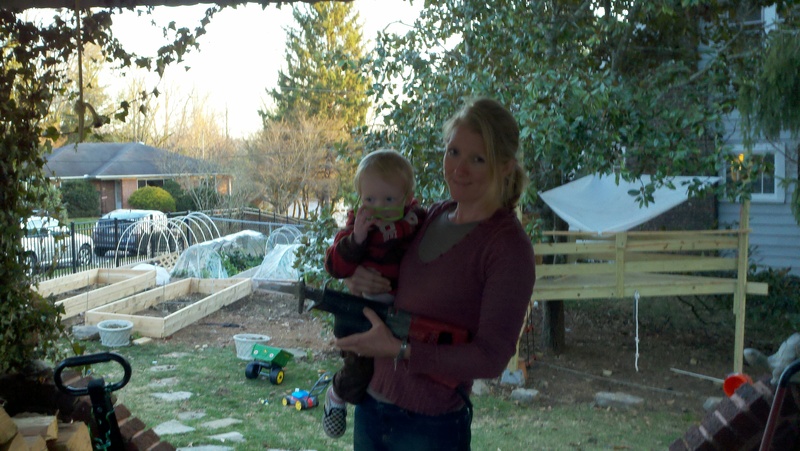 This time last year, I was in such a sleep-deprived fog from a year of colicky-baby nights (and no-napping days) that I didn’t even consider trying to build my raised beds. 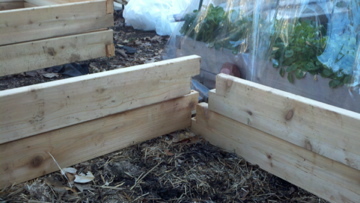 So I ordered some cedar raised bed kits online from Natural Yards and was thrilled to be able to put all four beds together in less than a half hour— seriously. Now that my almost-two year old has recently liked sleeping (hallelujah), my brain is working better, and the stretches of time when I can get things accomplished are starting to, well, stretch out. So I’ve decided to expand the garden with a few more raised beds. And instead of ordering kits again, I attempted a DIY/DIWLOHFB project to build the beds on my own. After enlisting my brother’s help, we got all the supplies, started building, and I by default was the helper/gofer. I didn’t mind a bit — as a mom to toddlers, it’s nice to have somebody else be in charge sometimes! Using the exact design of my existing from-kit beds, we got one bed done (measured, cut, assembled) before the first thunderstorm of the year came roaring along mid-afternoon. The ends of the pieces of lumber fit together after they've been cut. We cut and stacked another layer on top of these (making the beds 12" deep), then drilled holes all the way through the overlapping ends and secured them with metal dowels. Well, I was really DIY this afternoon, all the while entertaining my older boy and the neighbor girl with fun games — like pretending the scrap blocks from the lumber I was cutting were “rocket fuel” and “magic invisibility bars” to use in their treehouse adventures. I was feeling pretty cool and quite capable (hubris; pride before the fall). Should have known it was just toooo easy. Just as I was on the final cut, by brother drove up. Oh, was I proud that I’d done all that by myself — in under 3 hours! We went to put the pieces together, and — oh **$&%#. Cavewoman Carpentry, at its finest. Fortunately, my brother was able to fix it all (he basically cut off the end notches I’d cut and started all over again). 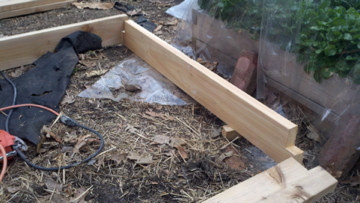 Lesson: Raised beds with cedar lumber are awesome. They look good, the cedar is safe for you and your plants, and it’s durable. However, if you’re going to DIY and you’re like me (limited carpentry skills), get some help from someone who knows, or plan very well. (I’m not a planner when it comes to gardening, hence my blog sub-title, “…by-the-seat-of-my-pants.” Smarty-pants brother reminded me “Measure twice, cut once.). Price-wise, it was about half the cost of the kit beds I’d ordered online. So definitely an advantage there if you’re competent enough to do the carpentry part. 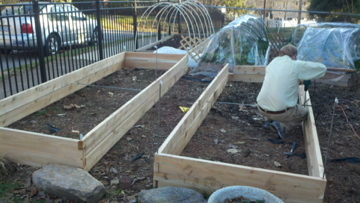 Note: You can make raised beds from just about anything and there are all kinds of ideas on how to do it on this about.com page on organic gardening. I always forward your post to Cord. We both really enjoy your blog! Thank you!